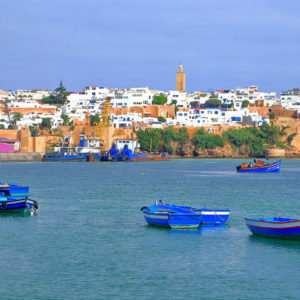 Rabat is the capital of the Kingdom of Morocco and the second largest city in the country after Casablanca. It is located on the Atlantic coast, south bank of the mouth of the Bouregreg River, facing the city of Salé, its “twin city” and is home to some 1.6 million people. Founded in 1150 by the Almohads, Rabat became an imperial city under the reign of Sultan Mohammed III (1757-1790). During the French Protectorate, the Ville Nouvelle (New Town) was designed and built, including royal and administrative areas, the colonial administrations and the Jardins d’Essais botanical and pleasure gardens – inscribed on UNESCO’s World Heritage List as a cultural property since 2012. The older parts include Hassan Mosque and the Almohad ramparts and gates, as well as remains from the Moorish, or Andalusian, principality of the 17th century. In recent years, Rabat has emerged as a business hub benefiting from the restructuring and reorganization of public administrations and as a popular tourist destination. The Sofitel Rabat jardin des Roses will host the 11th edition of the World Policy Conference. It is located close to the Royal Palace and is surrounded by 17.3 acres of Andalusian gardens.